The PC browser and smart phone game "Touken Ranbu-ONLINE-" created by Nitroplus went on to inspire a stage-play Touken Ranbu production - also known as "Tou-Sute." Play books for the first Tou-Sute work "Apocrypha: Tennouji Temple Ablaze" and second work "Canon: Dawn of the One-Eyed Dragon" are scheduled to go on sale in January 2018! In addition to the stage production original stories, they include an afterword from script writer and director Kenichi Suemitsu. Experience a whole new foundation of the Touken Ranbu world woven in words! 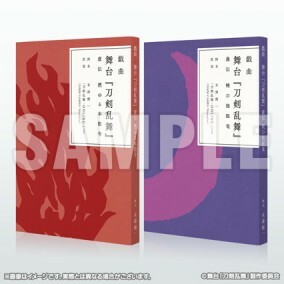 And this 2-volume "Touken Ranbu Stage Play: Apocrypha & Canon Set" is available at the Nitroplus Online Store! As a special bonus, it comes with 1 of 20 different "Stage Umbrella Pin-Badges." ・All text in these books in written in Japanese. ・1 of 20 "Stage Umbrella Pin-Badge" varieties is included at random. You may not select your preferred design. Due to product specifications, you may receive the same variety even if you purchase multiple items. ・At Comic Market 93, the "Stage Umbrella Pin-Badge" will be included at 2 units per set. ・The "Stage Umbrella Pin-Badges" are exactly the same as those handed out at Comic Market 93. First available at Comic Market 93.